The Scammel Commander Tank Transporter had it’s origins in a British Army requirement that envisaged main battle tanks weighing well over 60 tones. Development of the transporter began in 1976 but due to defence spending delays the production of a batch of 125 units for the British Army did not began until 1983. The British Army used it to tow the Challenger series of main battle tanks. The Commander was originally developed to replace the old Thornycroft Antars tank transporters. Designed to tow loads up to 65 tones, the Commander tows a special semi-trailer onto which tanks can be tail-loaded using a hydraulic 20 tone capacity winch. A prominent bonnet houses the vehicle’s Perkins (Rolls-Royce) CV 12 TCE V12 turbocharged diesel (similar to that used on the Challenger 1 main battle tank) which is coupled to an Allison automatic transmission incorporating a torque converter. The cab has provision for up to three or four passengers and there is space for two bunks behind the front seats. Due to the front axle lock angle, the Commander is highly manoeuvrable and can negotiate a ‘T’ intersection with only 9.15 meters between the walls. 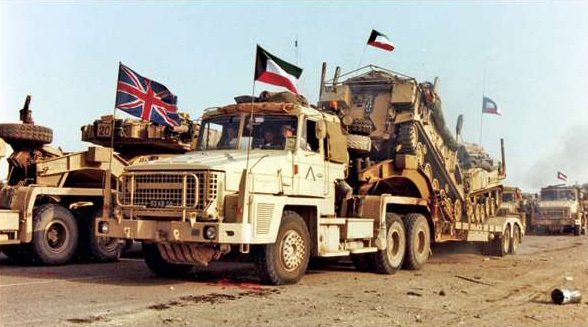 In 1990 during operation Desert Storm, 70 Scammel Commander heavy tank transporters were used to transport a variety of military cargo, including the Challengers. Each of the vehicles was on the road 17 hours a day during a 4 month period. On average each vehicle travelled 270 km a day on the desert roads. Most of the 125 British Army Commanders were based in Belgium and Germany with only a few located in the United Kingdom. The Scammel Commander is now obsolete and is replaced by the American Oshkosh M1070 heavy equipment transporter. Written and submitted by Bruce Forrest.